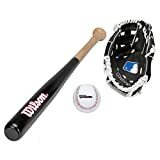 The Wilson Little League Baseball Kit comprises a 24″ baseball bat, soft compression baseball and baseball glove. This entry was posted in Baseball and tagged 24Inch, Baseball, League, Little, Multi, Wilson by FPSports. Bookmark the permalink.